Every year, Cannes attracts some of the world's most well-known companies for major conferences, such as the Cannes Film Festival or the Cannes Lions Festival. Since the early 1900s, this little French Riviera village has gained quite a reputation for itself, and is commonly referred to as "The City of Congresses". Now, when major companies send huge groups to these conferences, they constantly request that their team stay together. In a little town like Cannes, it can prove to be incredibly difficult to find group accommodation. 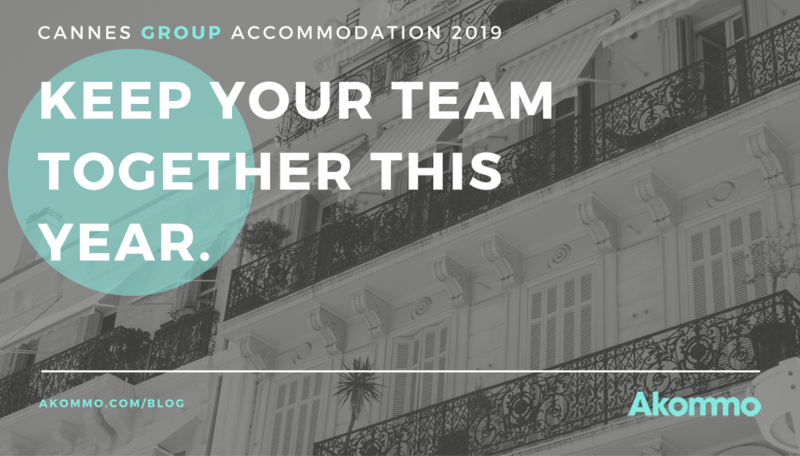 Today we're taking on the challenge and sharing 13+ options of Where to Book Group Accommodation in Cannes so you can keep your team in one manageable place. These Cannes group accommodation options are organised by street names in central Cannes, with additional information such as distance from the Palais des Festivals, and number of apartments per residence. To get more information about any of the accommodations listed, simply click on their links. This famous street is home to some of Cannes' most prestigious accommodation, shops, and landmarks. To keep your team together in one central Cannes location in the heart of Cannes, this residence is ideal! 30+ apartments, ranging from studios, 1-bedrooms, to even 3 bedrooms. Rooms available as well at the 4* Hotel Barriere Gray d'Albion featured in the photo below. Just 350 metres from the Palais des Festivals, this residence is a quick 4-minute walk to the conference centre. 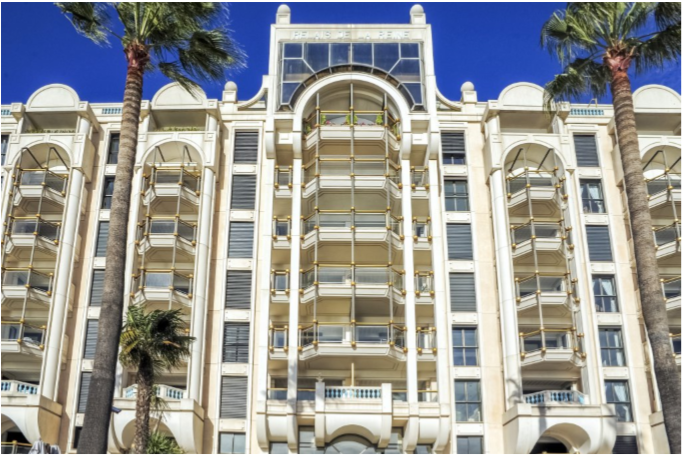 If you're looking to stay in one of the most iconic residence buildings in Cannes, the Palais Miramar is a timeless option. 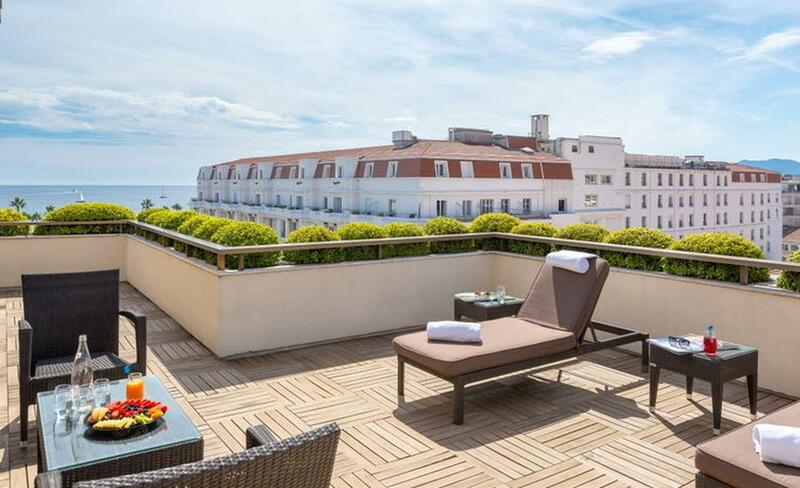 Located on the famous Boulevard de la Croisette, this residency building was once a famous hotel in Cannes. This Cannes landmark offers accommodation of all types, budgets, and tastes. The views from these apartments are absolutely breathtaking. Over 50 studio, 1-bedroom, 2-bedroom and 3-bedroom apartments depending on event availability. If you have a specific request and need assistance, feel free to contact us with your event requirements. Insider tip- When booking an accommodation, just because the address says Boulevard de la Croisette, doesn't mean that you will be close to the Palais des Festivals. This famous promenade is almost 2km (about 1 1/4 mile)! If you and your team are looking for a bit of peace and quiet, this is a great option to escape the madness. This new residence offers 6 tasteful apartments with cosy furniture, double glazed windows, a kitchen or kitchenette, air-conditioning and heating, satellite TV, and WiFi. Prepare to sleep soundly. Just a brisk 10-minute walk. Insider Tip - Careful, you'll pass by some of Cannes most delicious bakeries and cafes. Don't say we didn't warn you. To have the ultimate security for you and your team, the Résidence Jardin de la Croisette is the perfect choice. Located just behind the famous Cannes Carlton Hotel, this Cannes Group Accommodation offers precious views of the sea, modern apartments, and of course, a private garden with access for guests only. 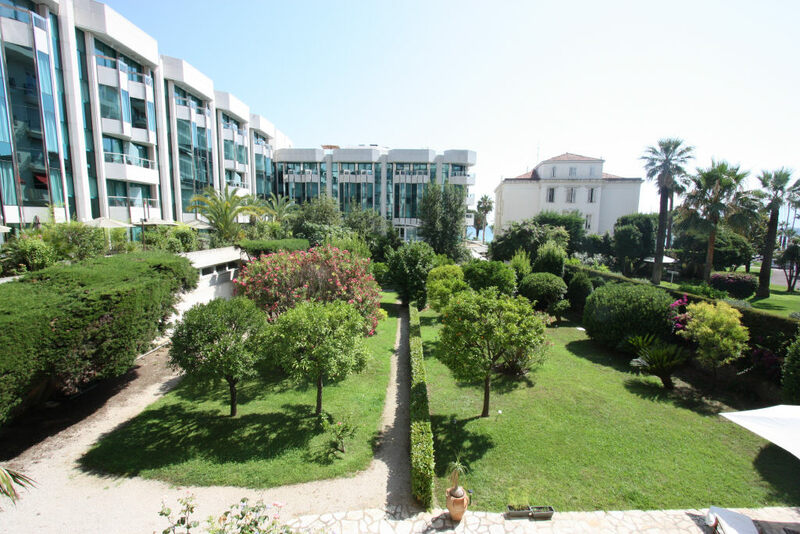 A 12-minute walk from this secure residence to the Cannes conference centre. 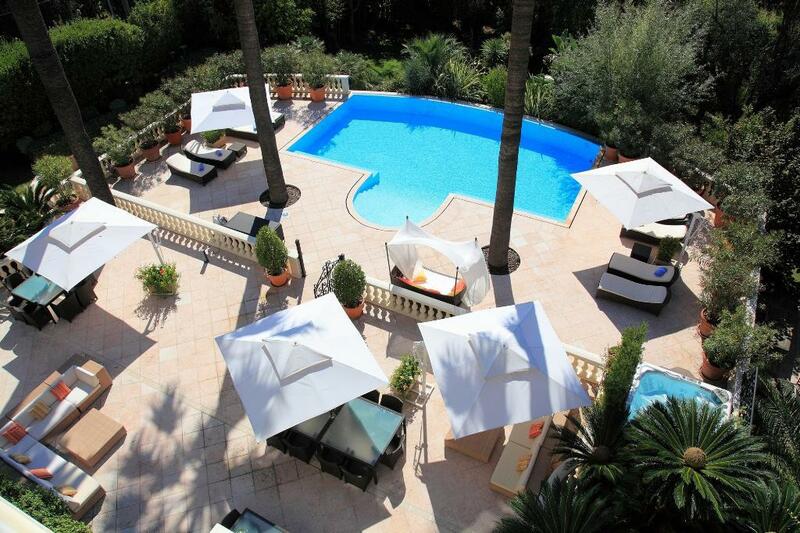 Looking to keep your team in one of the most luxurious residence buildings in Cannes? We LOVE the Relais de la Reine residence, and our clients do, too. With carefully-designed and modern apartments in Cannes, 24-hour security, and right next to some of the most expensive designer stores in Cannes, this is a great option for a small team. 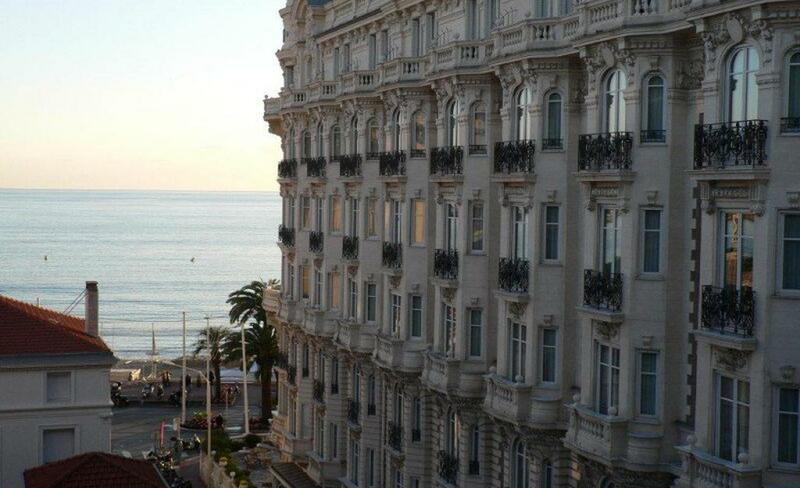 A gorgeous 5-minute walk along the Croisette Boulevard. Insider tip - The full building has been bought by a new investor in 2018 who has hired an architect to refurbish it so the entire Relais de la Reine will not be available for MIPIM 2019 rentals. 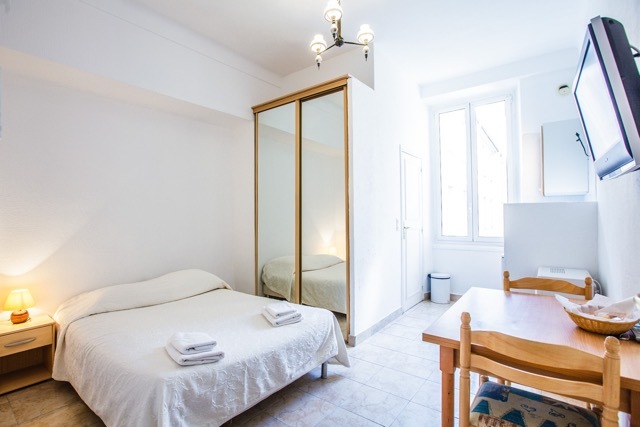 If you have a large team and want to stay in the centre of Cannes, these Foch Studios are just what you've been looking for. With 12 affordable group accommodation options, just moments from the best bars and restaurants in Cannes, and a quick walk from the Palais, your team will appreciate the comfortability of these studio apartments. Just a quick 4-minute walk to the promised land. 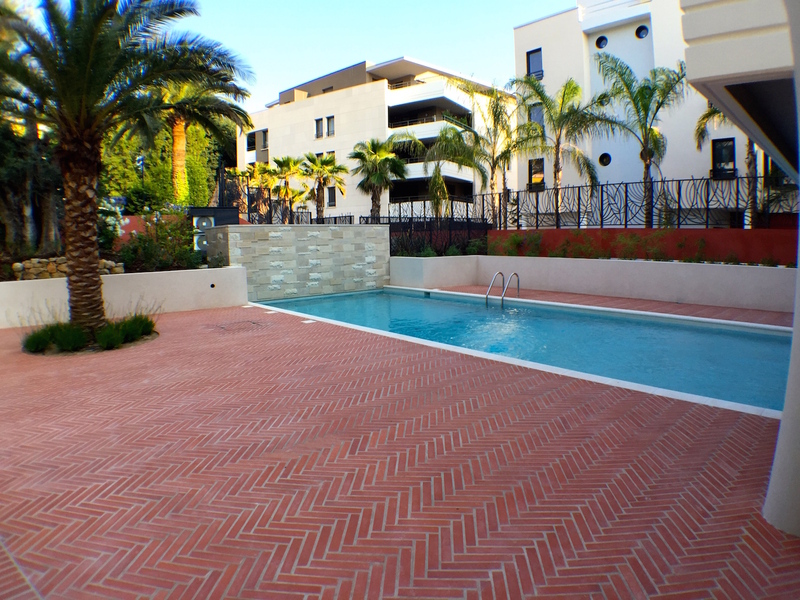 Though it's located slightly outside of the city, this apartment complex located on Boulevard Montfleury is a great option for those who want a more local Cannes experience. Not to mention, there is a gorgeous swimming pool and jacuzzi available to all guests at the apartment complex. Situated next to the most classical buildings in Cannes, such as the Martinez Hotel, this residency with an incredible lawn, offers various options for a comfortable group accommodation. Coming with a car? This building has spots available for its guests! During the biggest conferences in Cannes, you'll see incredible events set up all over this property. From affordable options to incredible luxury apartments, keep your team in the centre of Cannes near all of the action. Not to mention, some of these apartments have space for small gatherings or meetings. Over 30 apartments ranging from studios, one-bedroom, and two-bedroom apartments, all featuring breathtaking views of the sea. This central side street is tucked away just next to Cannes' beloved pedestrian street, Rue Hoche. If you and your team want to be located next to the best cafes, pastry shops (Jean Luc Peré, s'il vous plaît) and just a few moments from the conference centre. 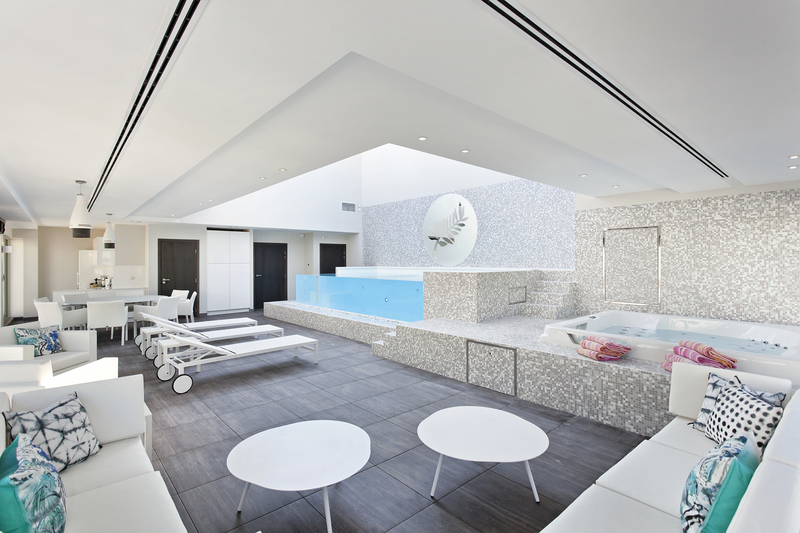 For teams of 15 or more staying in Cannes centre, this is the perfect option. A quick 5 minute walk and you'll reach the Palais des Festivals. One of the newest residency buildings in Cannes, the Palais Penthouse building is the perfect option if you're looking to host meetings, networking cocktails, or luncheons with clients. Constructed just in 2017, additional to accommodation, this space offers a large reception area with an incredible covered roof terrace and an interior swimming pool, a jacuzzi, and a sunroof. There is an elevator to get your guests from the ground floor to the stunning rooftop. 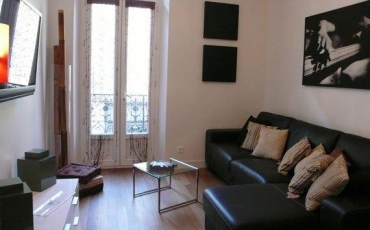 1st floor: 2 studios (35m2). 1st floor:2 one-bedroom apartments (40m2), all with sofa beds and 2 single beds, kitchenette, bar table, flat screen TV, bathroom with shower and toilet. 2nd floor: 3-bedroom duplex (170m2). 3rd floor: Terrace of (130m2) max 110 people party size. Just 3 minutes from the conference centre! Tucked away in the middle of one of Cannes' busiest streets, this urban villa is an ideal hideout from the stress of events. If you and your team want to kick back and relax after a long day of conferences and networking, you'll feel like you're right at home (or even better!). This villa boasts 4 bedrooms, en suite bathrooms in each, and a private garden and patio. 4 double beds and 4 bathrooms, and a gorgeous garden. 4 minutes walking, and just 5 minutes from the beach. 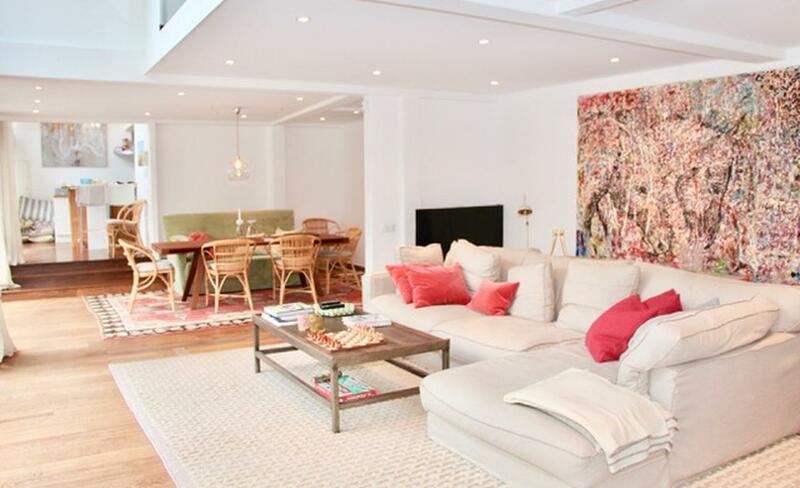 Year after year, clients book these apartments on Rue Notre Dame because of their perfect location. Located near some of the best bars and restaurants in Cannes, the Residence ND is a popular choice for events such as Cannes Lions and the Cannes MIPIM. Keep your team near all of the action and stay in this residence located just behind the Cannes Majestic Hotel! 8 apartments total, all of which are 1-bedrooms. 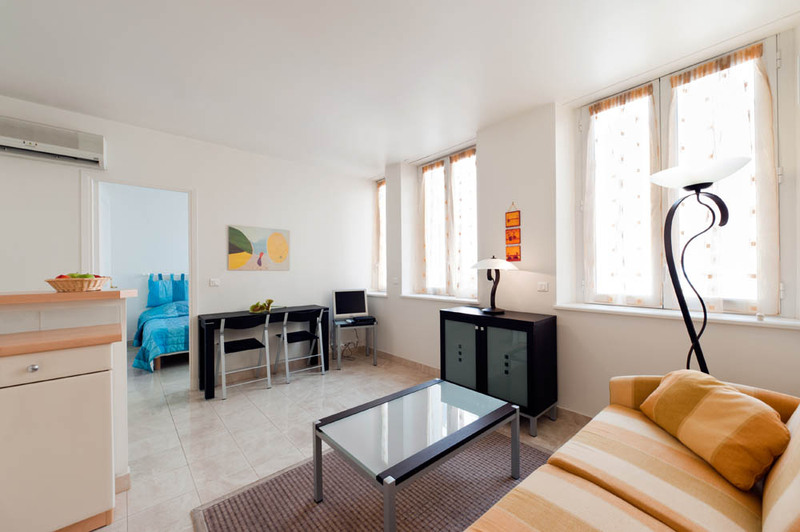 Just 2 minutes from the Palais des Festivals, making your corporate stay a breeze. Insider tip - This Cannes residence is just a stone's throw from the famous church, "L'église Notre Dame de Bon Voyage", which was built in the 1800s! Last but not least, if your team is looking to go all out this year, the options are impressive when it comes to Cannes villas. This spectacular villa located on the Boulevard Carnot offers 9 bedrooms, 750m2 of living space on three floors with a spacious library, living room with a fireplace and formal dining room, all opening onto a beautiful terrace and billiard room. Not to mention, the heated swimming pool and 3000m2 of land, all for you and your team. Nothing like a villa to keep the team together. You can host up to 350 people here for your next epic Cannes party! 9 bedrooms total with 7 double beds and 4 single beds, and 9 bathrooms. This incredible villa is just a 13-minute walk from the congress centre! Have an upcoming event in Cannes and need unique venue options? Fill out your event requirements and we'll send you a free proposal with the best options! If you can't find what you're looking for, shoot us an email at contact@akommo.com and we'll do an extensive search for you and your team!